Portfolio Manager, Venable Park Investment Counsel Inc.
What soars up tends to crash down. Welcome to ‘free’ money driven asset moves. 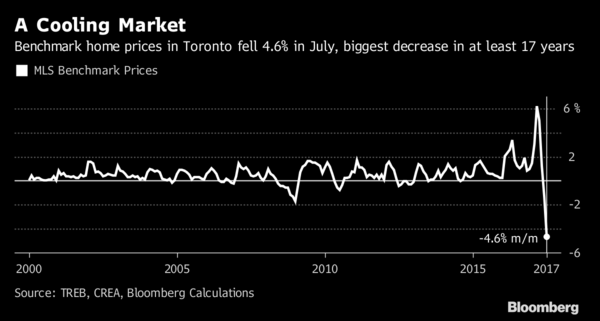 Home prices in Canada’s largest city posted their biggest monthly drop in at least 17 years in July and sales plunged as government efforts to cool the market and the near-collapse of a mortgage lender made buyers leery. The benchmark Toronto property price, which tracks a typical home over time, dropped 4.6 percent to C$773,000 ($613,000) from June. That’s the biggest monthly drop since records for the price index began in 2000, according to Bloomberg calculations, and brings prices down to roughly March levels. Prices are still up 18 percent from the same month a year ago, according to the Toronto Real Estate Board. Transactions tumbled 40 percent to 5,921, the biggest year-over-year decline since 2009, led by detached homes. This is only a start in the long overdue and much-needed mean reversion journey back to affordable Canadian shelter once more. The average sale price in July, for all property types in Toronto, was still up 5% (C$746,218) from July 2016, compared with a 17% increase from July 2015 to July 2016. Nationally we watch for the home ownership rate to retrace from recent all-time-highs near 70% in Canada to the long term norm around 64%. In the process, the marginal 6% of buyers who could not actually afford the homes they stretched to buy the past few years will default and/or liquidate in order go back to renting. In the US cycle from 2007-2012 this same home ownership ratio correction translated into an average 40% price correction nationally. Ten years later even with trillions of QE into the banking system, many areas have still not recovered their 2006 peaks. Necessary lessons on the downside of excessive borrowing/lending/monetary stimulants. Canada has some re-learning due.